For your Denver party venues you can rent the event center at the Arrowhead Manor. We can accommodate one hundred people in our event center and have up to sixteen people stay overnight. The Manor is only thirty minutes south of Denver in a beautiful location for your Denver party venues that will take your breath away. Love is never­-ending! Tell your significant other “I still do, and always will” with Arrowhead’s Vow Renewal Package. Starting at just $299 (for a couple with an overnight room rental)*. If you are looking for just a venue only for your wedding or event, Arrowhead can help with that too. Say marry me in Colorado and start the wedding ball rolling. Some people prefer to put everything together themselves or have people they know that can help them save some money. All rentals need to come from Colorado Party Rentals. They have a great selection, fair pricing, and are used to working with us. Other than that, you can supply your own servers, food, DJ, flowers, officiant and cake to complete the wedding. Arrowhead will still supply the chairs and tables, including setting them up and taking them down. This includes the ceremony area on the main deck and the reception area one level below. You are still able to supply your own liquor to save even more (liquor can add thousands with an open bar!). Overnight accommodations are required when booking in high season (May-­September, and some select days in off season). From just $2000. From $8995 for inclusive including overnight rooms! 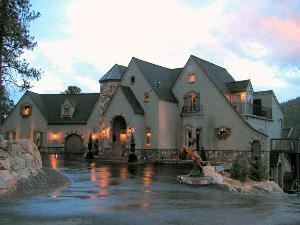 Arrowhead Manor has the best Denver wedding venue center in the area. Our location offers gorgeous mountain views and a fantastic event center for your wedding reception. We can accommodate up to one hundred people for the ceremony and reception and for people staying the night, we can sleep up to eighteen (two rooms with 4 people). Have family or close friends stay over for the night and have a delectable breakfast that following morning in our fantastic Great Room. The best opulence that you will find anywhere in the area for your Denver wedding venue for your special occasion.